The recipe makes quite a lot of fudge but it lasts for ages in the fridge and makes cute gifts soooo it’s pretty easy to get rid of. First, prepare everything. If you’re braving this recipe alone like I did then you will need to have everything ready as you can’t stop halfway through the process and sort stuff out. Line a 20cm square tin with baking parchment, leaving some overhang for ease of removal. 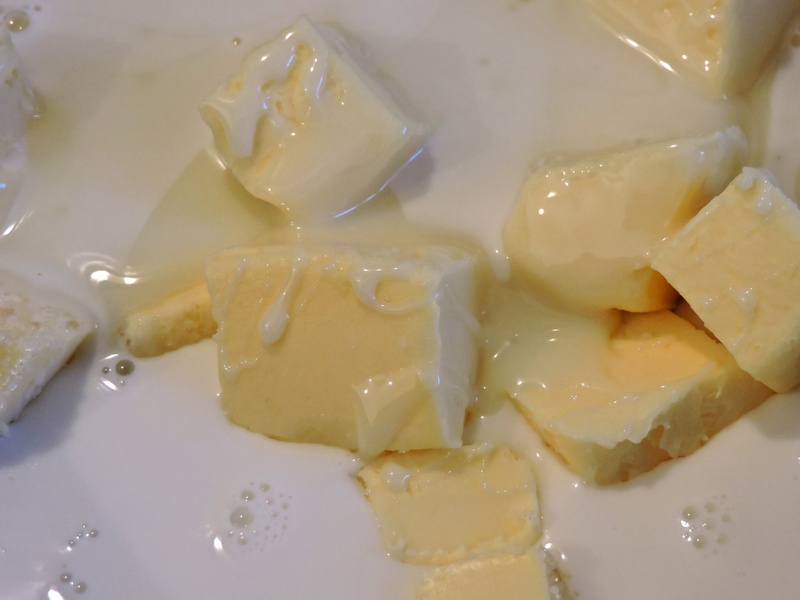 Chop your white chocolate finely and place in to a microwave safe bowl and cover lightly with cling film. 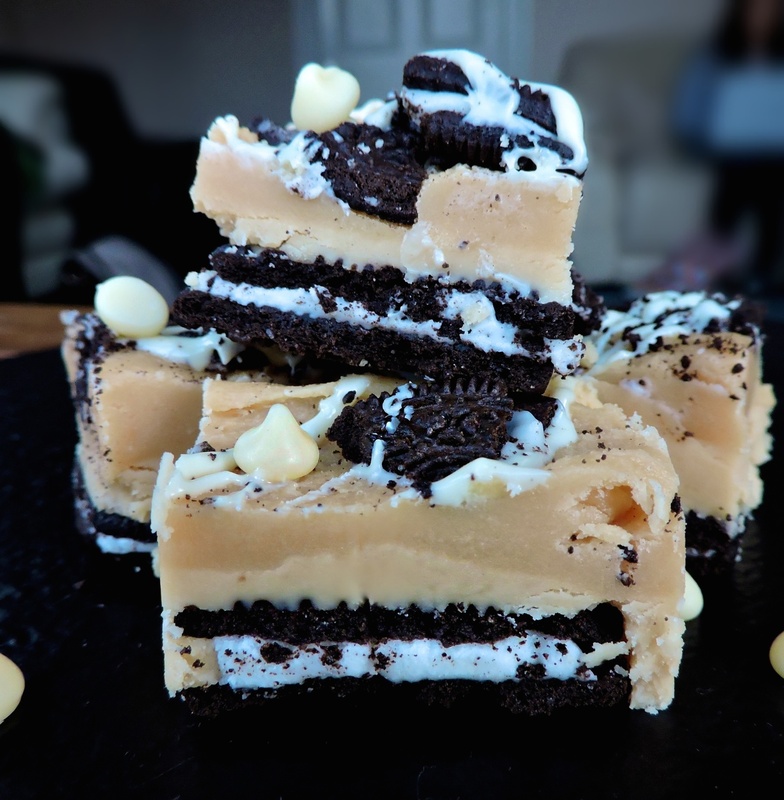 Place an even layer of oreos on the bottom of your square tin. Next, add the condensed milk, both sugars, milk and butter to a large saucepan. I actually used a wok and it worked fine. Melt the mixture on a low heat stirring until the sugar dissolves. It shouldn’t feel grainy to the touch. At this point you need to attach a sugar thermometer to the side of the pan, bring the mixture to the boil and then simmer. Keep continuously stirring until the mixture reaches 118°. It takes around 10-15 minutes. (Melt your white chocolate at this stage, about 3-4 30 second blasts in the microwave should do it.) If you don’t have a sugar thermometer then keep a jug of cold water handy and drop a small amount of the fudge in to it after 10-15 minutes of continuous stirring. A soft ball should form. As soon as this stage is reached, take the pan off the heat and beat it for about 5 minutes. After 5 minutes, separate just over half of the mixture in to another bowl and add the melted white chocolate, reserving some for drizzling over the top and some for the middle of the fudge. Beat this for another few minutes. Beat the vanilla extract in to the remaining fudge until it is thick, creamy and looks ready to set. 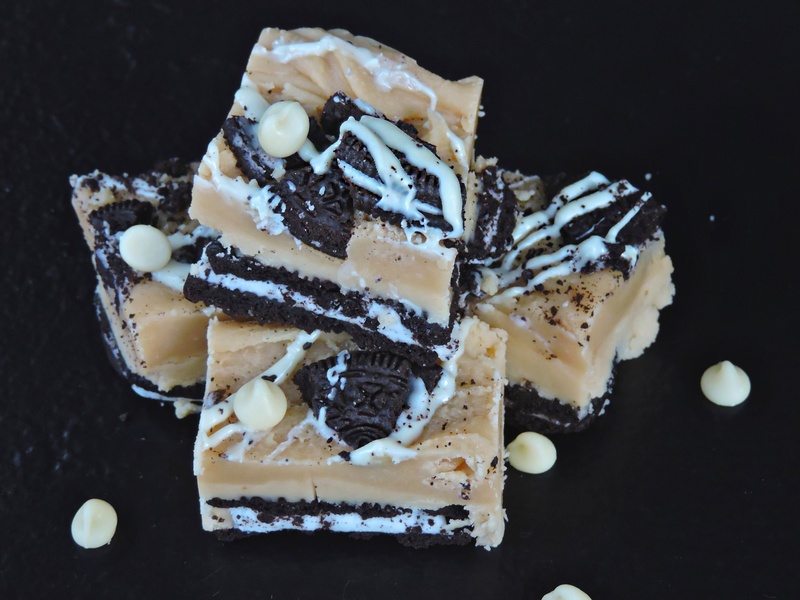 Take your square tin lined with oreos and drizzle a little of the white chocolate over the oreos, the point of this is so that the oreos have something to stick to in the fudge. 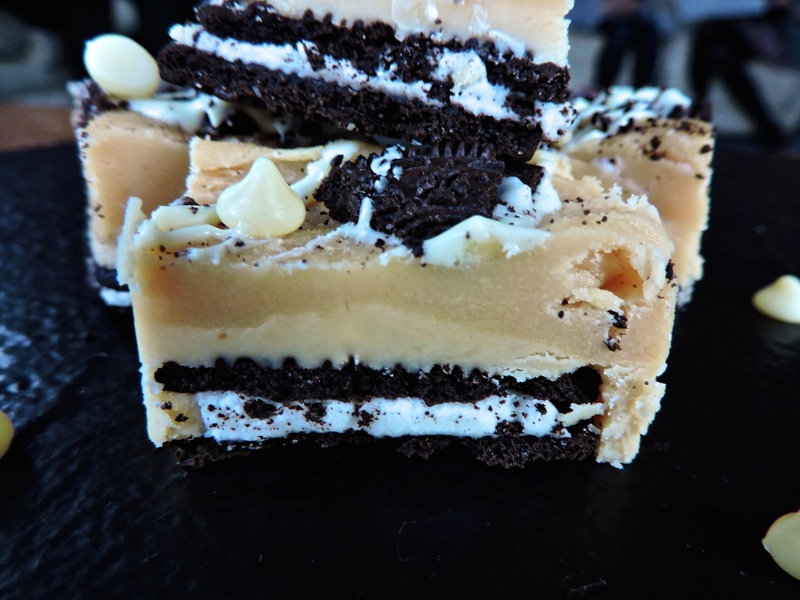 Pour your white chocolate fudge over the oreos, spreading the mixture out with a palette knife. Then pour the vanilla fudge over that and spread it out evenly. 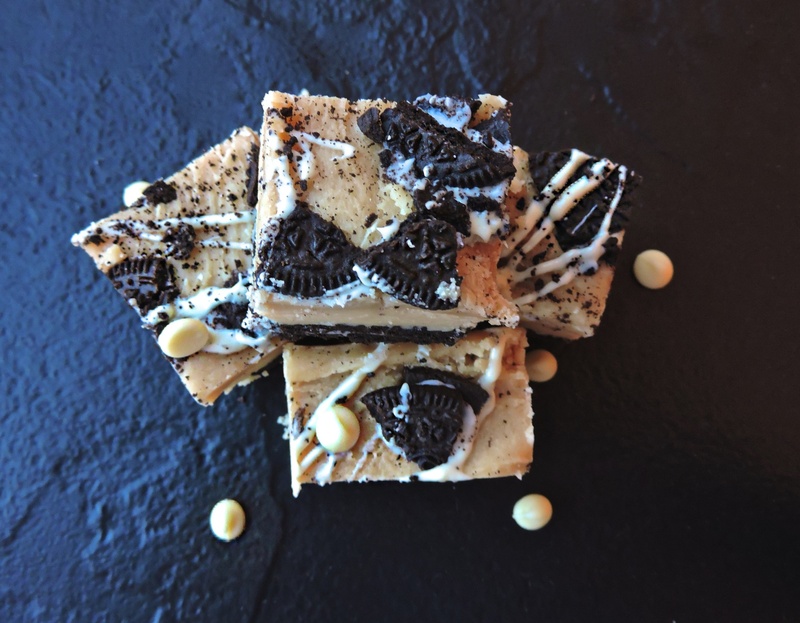 Top the fudge bars with crushed oreos and drizzle over the remaining white chocolate. Leave the fudge to set and then cut it in to squares.